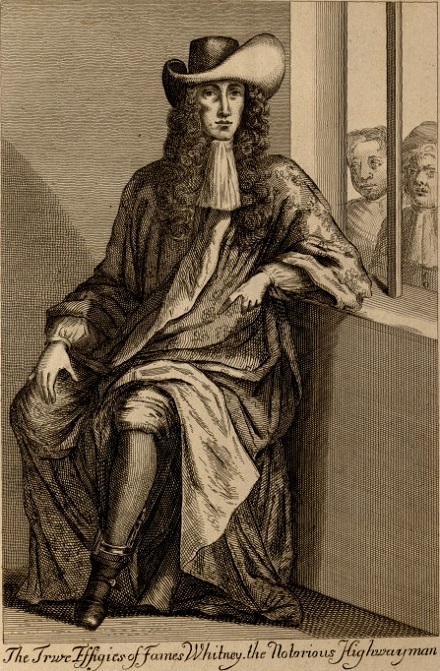 Dapper highwayman James Whitney was hanged at Smithfield on this date in 1694. A monument to the allures and the perils of a midlife career change, Whitney threw over a tiresome life as the proprietor of an inn in Cheshunt, Hertfordshire,* purchased with his liquidation the accoutrements of the gentleman thief, and took to the road. “Captain” Whitney — he had no right to the rank he appropriated for himself — was one of those stickup men who greatly esteemed the pose of honor associated with his new calling. On one occasion, he relieved a gentleman traveler of a large sack of silver on Newmarket Heath, but when his victim pleaded the length of his journey Whitney opened the bag to its former owner with an invitation to take what he would need. In another fine caper (there are more of them assembled here) Whitney told a man to stand and deliver, only to have the traveler reply that he was about to say the same back to him. The two robbers laughed at their encounter and went their separate ways, but Whitney later chanced to turn up at the same inn as his so-called brother plunderer and overhear him regaling his fellows with the tale of having outwitted a highwayman by pretending to be one of the same profession. Whitney stalked the man and a companion out of the hostel the next morning and this time robbed them successfully: “You should have kept your secret a little longer, and not have boasted so soon of having outwitted a thief. There is now nothing for you but to deliver or die!” Nobody likes your stories anyway, you blowhard. Nobody knows any of James Whitney’s peers in the publican guild, but as Captain Whitney he joined England’s most legendary gentleman outlaw in verse. Rumbold and Whitney — a jolly crew! Share the fate of the brave Du Val! Who carved his name on the Newgate Stone. * The George Inn. A map search does yield a The George in Cheshunt; whether this is actually the same facility where our famous highwayman once earned a lawful keep, I have not been able to establish. ** Parables from this golden age of highwaymen often place in the mouths of outlaws sharp critiques of their targets, who despite putative respectability turn out upon examination to be far more deeply corrupt than the dashing adventurer. See for example Old Mobb.